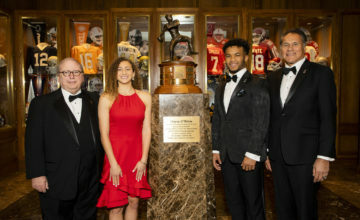 FORT WORTH, Texas (Oct. 3, 2016) – Of the eight quarterbacks named to the Davey O’Brien “Great 8” for week five of the college football season, seven are multi-time selections in 2016, while the other was the 2015 Davey O’Brien National Quarterback Award winner. 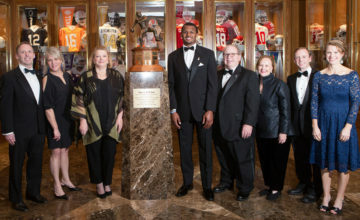 The eight honorees, as determined by voting from the award’s selection subcommittee, include: Washington’s Jake Browning, Joshua Dobbs of Tennessee, Louisville’s Lamar Jackson, Mason Rudolph of Oklahoma State, North Carolina’s Mitch Trubisky, Greg Ward Jr. of Houston, Clemson’s Deshaun Watson and Davis Webb of California. Jackson is on the list for the fifth time in as many weeks this season. Dobbs (Weeks 2, 4 and 5) has been named “Great 8” three times, while Browning, Rudolph, Trubisky, Ward and Webb are on for the second time. 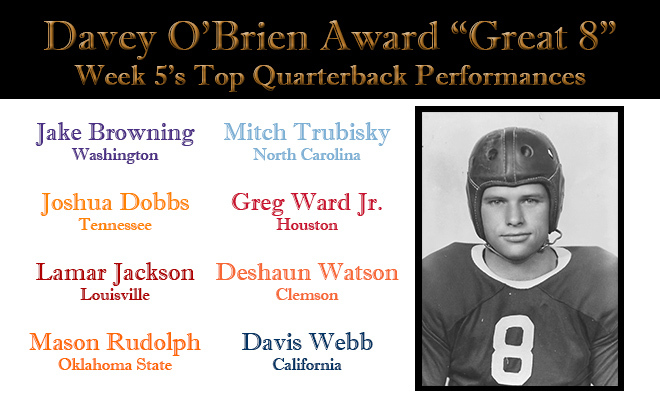 In addition, 2015 Davey O’Brien National Quarterback Award winner Deshaun Watson made the list. 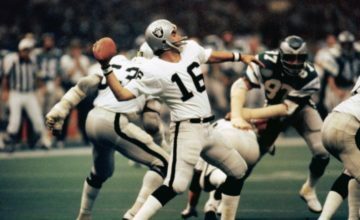 Had three touchdown passes and just six incompletions (15 of 21), while throwing for 210 yards in a 44-6 triumph over No. 7 Stanford. Fired game-winning 43-yard Hail Mary with no time left as part of his four total touchdown performance (16 of 26 passing, 230 yards, 3 TDs) in a 34-31 victory over No. 25 Georgia. Rushed for 162 yards and two touchdowns on 31 attempts and was 27-for-44 passing for 295 yards and a score in a 42-36 defeat at No. 5 Clemson. Connected on 19 of 28 pass attempts for 392 yards and three scores, and also rushed for a touchdown, as the Cowboys earned a 49-31 win over No. 22 Texas. Helped the Tar Heels grab a last-second 37-35 win over No. 12 Florida State by running for a score and completing 31 of 38 passes for 405 yards and three touchdowns. Amassed 454 total yards (389 passing, 65 rushing) and five touchdowns (three passing, two rushing) and was 32 of 38 through the air in a 42-14 win over UConn. Threw five touchdown passes, including two in the final seven minutes, and had nearly 400 total yards (306 passing, 91 rushing) in Clemson’s 42-36 victory over No. 3 Louisville. Was 22-for-35 passing for 306 yards and four touchdowns to lead California to a 28-23 win over No. 18 Utah, the Bears’ second straight win over a top-25 team.